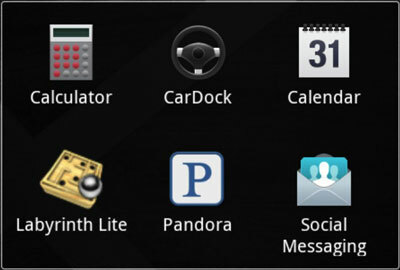 All applications installed on your Droid X appear in the Applications Tray. Although you may find shortcuts to applications (apps) on the Home screen, you go to the Applications Tray to find everything. 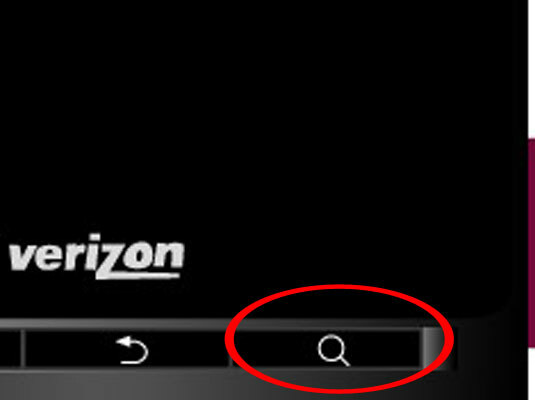 The Launcher is the center button, with a triangle in a circle. After touching the Launcher button, you see the Applications Tray. 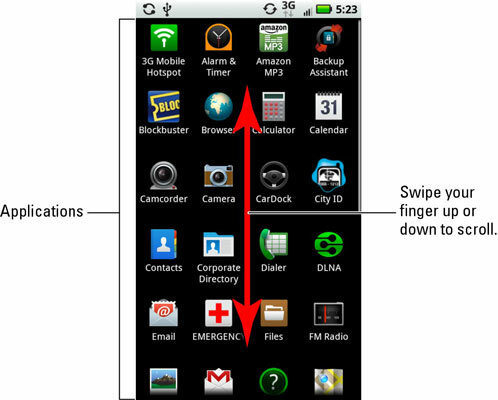 Scroll the list of app icons by swiping your finger up or down. Touch an icon to start that app. The app that starts takes over the screen and then does whatever good thing it’s supposed to do. Press the Search soft button. The Search screen appears. A search text box appears atop the screen, and the phone’s onscreen keyboard appears at the bottom. Use your finger to type all or part of the app’s name. While you type, items matching the text you’ve typed appear in the list. The items include applications, music, contacts, and even locations on the Internet. When you’re looking for a program, the text Application appears beneath the program name. Scroll the list to explore the apps that match your search. Use your finger to swipe the list up and down. Touch the name of the app you’re looking for. You probably use the same apps repeatedly, on both your computer and your phone. You can easily access the list of recent programs on the Droid X by pressing and holding the Home soft button. When you do, the six most recently accessed programs appear. For programs that you use all the time, consider creating shortcuts on the Home screen. Also, future releases of the Android operating system may present more than just six recently used apps when you press and hold the Home button.